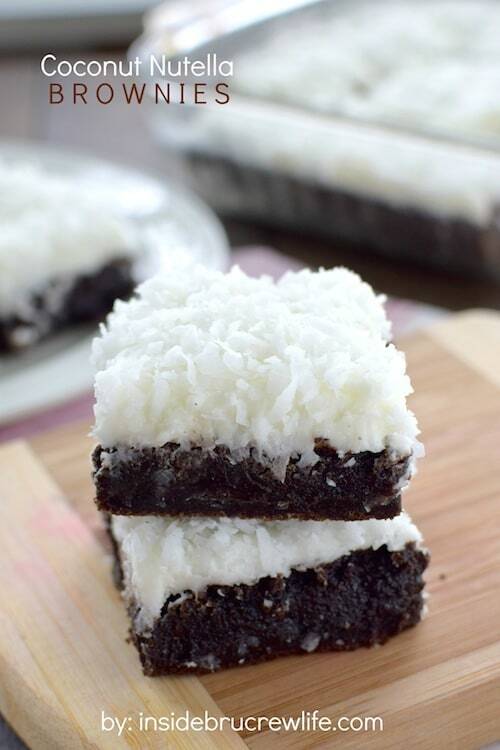 Adding a thick layer of frosting makes these Coconut Nutella Brownies a dreamy summer dessert. 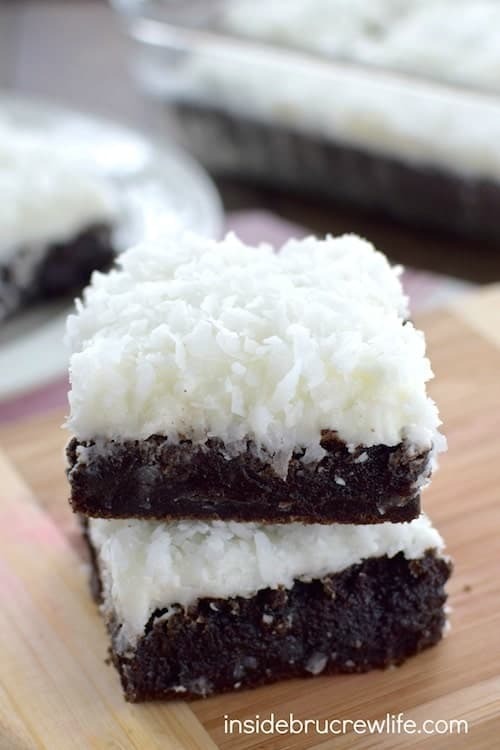 The fudgy brownies and coconut topping are sure to get rave reviews from everyone that tries them. 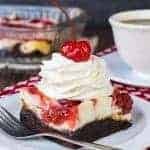 *Love these recipes? Be sure to sign up for the BruCrew email to have these recipes delivered to your inbox each time a new recipe is share. We go through a lot of brownies in our house. My youngest absolutely loves brownies…plain brownies that is. I tried to sneak chocolate chips in them one time, and he totally called me out and said those weren’t plain. He actually had me show him how to make a box brownie all by himself. So now, when that brownie craving hits, he can do it all by himself. It’s so cute to watch him in the kitchen making his pan of plain brownies. 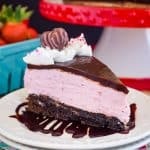 Sure I like a good plain brownie every once in a while, but usually I have so many crazy dessert ideas running through my head that plain just isn’t an option. I mean cake batter cheesecake brownies, salted caramel brownies, and marshmallow brownies just sort of happen. Yup, brownies always get the fun treatment when I’m baking. I took these homemade brownies and jazzed them up coconut and Nutella style. That combo always reminds me of our trip to St. Maarten a few years ago. Waking up late, eating coconut Nutella crepes for breakfast, and sending the day on the beach were how we spent every single day there. It was amazing! I think a trip back needs to happen again. 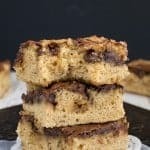 Using coconut oil instead of butter helps add a little more coconut flavor to the chocolate brownie, and a generous scoop of Nutella swirled in the batter make them even fudgier. Then to top them off, a thick coconut frosting with lots of shredded coconut is the perfect touch. I do like to under bake my brownies, but you can bake them a few minutes longer to firm them up more if you like. The frosting and Nutella really help keep them soft and amazing for days! I had to send the rest of the brownies with my hubby to work because I couldn’t stop swiping little bites every time I went in the kitchen! Coconut and Nutella give these fudgy brownies a tropical boost. These honestly get better and better each day. Place the coconut oil in a small sauce pan over low heat and stir until melted. Whisk in the cocoa powder. Let cool slightly. Beat the eggs until frothy. Add the sugar and extracts and beat again. Slowly add the melted coconut oil and chocolate mixture and beat again. Stir together the salt, flour, and baking powder. Add to the egg mixture slowly. Add the Nutella and stir in gently. Spread the mixture in a greased 9x13 baking pan. Bake at 350 degrees for 32-35 minutes. Let cool completely. Beat the coconut oil, extracts, and salt until creamy. Slowly add the powdered sugar and whipping cream until everything is mixed in. Beat on high until light and fluffy. Spread on the cooled brownies. Top with coconut. Cut into 24 squares. Store in a sealed container. These are definitely the best way to start out the week!!! These look incredible! 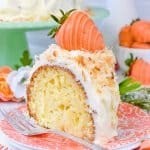 Love the thick layer of coconut frosting! That frosting was so fluffy and delicious!!!! I ate too many spoonfuls of it! Wow! I love the thick layer of coconut frosting on these! You had me at Nutella! Love the idea of combining it with coconut! Nutella has a way of doing that to me too!!! I can see why you sent these out of your house…I’d be nibbling on them every chance I got, too! So many awesome things rolled into one! Believe me, I nibbled way too many before sending the rest away! They were too yummy! If I can’t go to St. Marteen, at least I can make these yummy brownies! Yes, make the brownies and think happy thoughts about being on a beach!!! These look amazing, Jocelyn! That glorious mound of coconut is totally hooking me in! Love these! These look fabulous with that mound of coconut frosting! I adore all things coconut too!!! Swooning over that thick layer of coconut frosting – YUM!! These brownies look absolutely amazing. 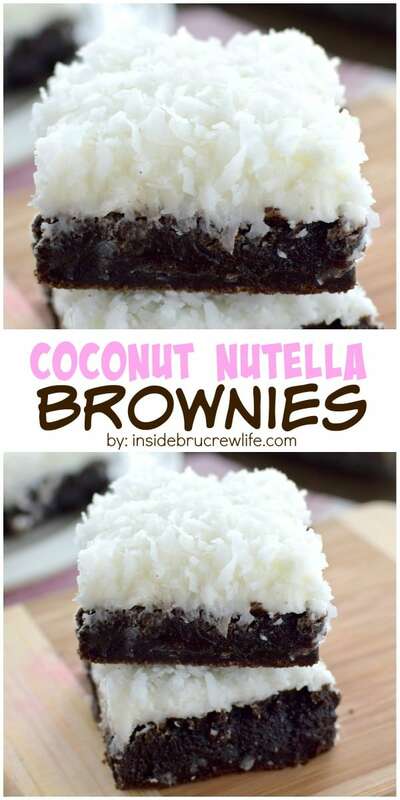 Love coconut and nutella additions to the brownies. 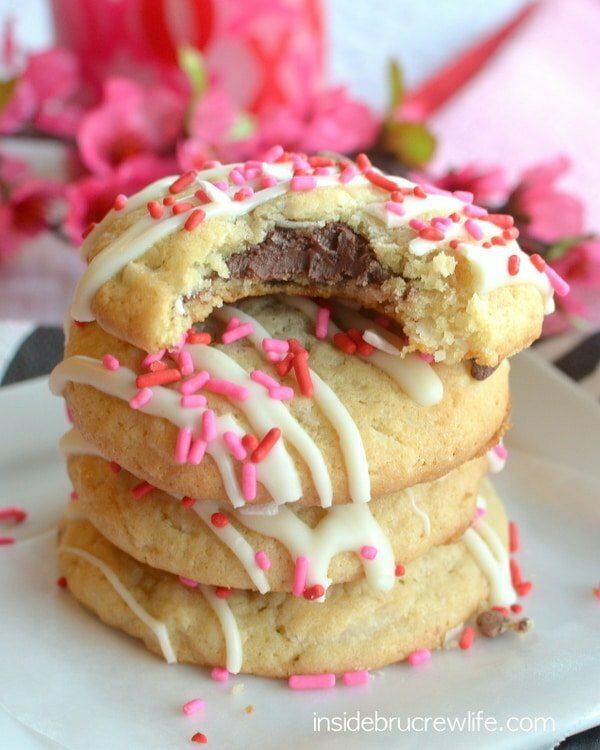 I would absolutely need to usher these out of my house if I made them… I’d be eating every last one! I was so afraid that was going to happen, so I packed them up and sent them away!!! These brownies look utterly amazing Jocelyn! That coconut on top is calling MY NAME! You must answer that call!!!! It’s a brownie kind of a day, right? Okay, I can’t believe he won’t even let you sneak in some chocolate chips! Good for him for taking it upon him to make his own though — how fun! I love ALL of the things in these, maybe even better than plain brownies! He is a little stinker, but at least he knows how to make them by himself now!!! Give me all the loaded brownies!!! Decadent is definitely the word for these brownies. I hope you enjoy them, Joan!!! I love that your son took control with his brownies! Not even chocolate chips? That kid is a purist. 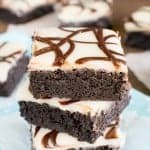 And you know, it’s so ironic that his baking blogger mom makes all this amazing stuff, and he still wants the plain, boxed mix brownies. When I was a kid eating just store-bought stuff, I would have given a lot for regular creative treats! 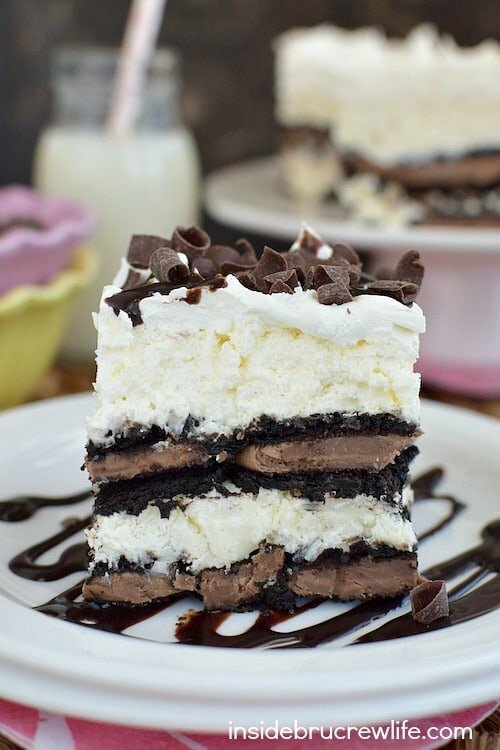 These look incredible and fudgy. And that snowy drift of coconut is just PERFECT. Wow these brownies look amazing, Jocelyn! 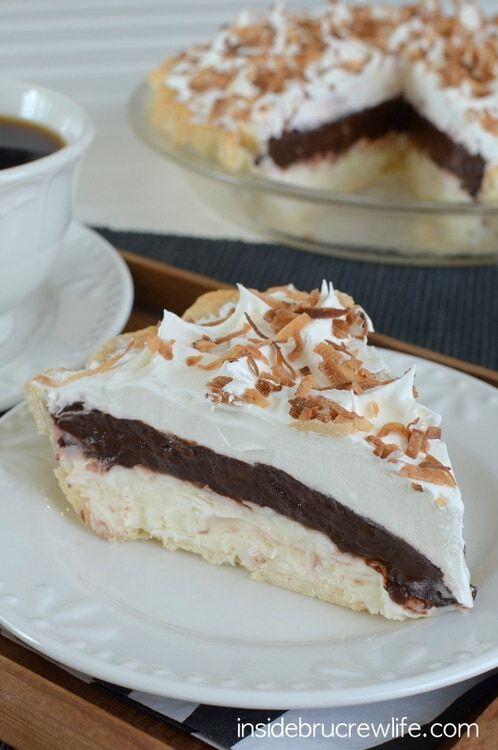 Such a great idea to combine nutella and coconut! What a fantastic treat! Yes to the whole shebang! That coconut frosting is calling my name, and that brownie looks super thick and gooey. Ah I’m in LOVE with these brownies!! Brownies are my favorites food ever, but add nutella and coconut, and it’s pure heavenly bliss!! These look absolutely delish!! I love a good brownie too…especially one loaded with goodies!!! 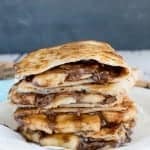 I love the idea of coconut and Nutella! But let’s face it, I love the idea of anything with Nutella. 😉 Pinned! Nutella is pretty down right amazing!!! Thank you for the pin love! Wow Jocelyn, dark, rich and delicious. This is a triple threat! Do you think it would be okay to freeze these?? They didn’t last long enough around here for me to freeze them. I don’t see why you couldn’t do that with these brownies though. Just make sure to put them in single rows separated by wax or parchment paper inside a freezer bag or container.